Bath, 1756 - and a very dashing gentleman known only as the Doctor is newly arrived in town, accompanied by his lady friends Mrs Clarke and Mrs Ramon. He’s created a stir among the gentlefolk of Georgian high society – and a stir in the heart of merry widow Mrs Theodosia Middlemint, rumour has it. They are not the only strangers from abroad causing tongues to wag, however. The mysterious Lady Clara, come from Amsterdam in the company of the noble Captain Van Der Meer, has the whole of Bath agog. Who is she, really? What is she, really? But there’s something terrible beneath the veneer of Georgian gentility. As awful a horror as the Doctor has ever exposed, hidden inside Balsam’s Brassworks. Something that needs to be brought to light, for the sake of all humanity. Episode Lengths: 1 = 32'18", 2 = 30'27", 3 = 29'38", 4 = 32'35"
Also features 24 minutes of trailers, music and special behind-the-scenes interviews with the cast and producers. 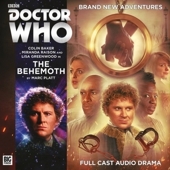 Issue 104 of 'Vortex - The Big Finish Magazine' was also sent out to subscribers with this release.